I've been super excited to try out the "Moon Manicure", eclipse version, ever since its debut at Ruffian's Fall 2010 NYFW Show. I know I technically didn't have to wait until fall to do this mani, but I love the dark nails with the metallic, and that doesn't exactly read "summer" to me. I know it's not yet fall...but I'm antsy and it's close enough. My first attempt didn't pan out so well because I used nail guides...big mistake. It left my manicure all lumpy and the lines weren't really straight. This time, I freehanded it, and I think my results were much better. Check out my mani after the jump! Love, love this dark wine with the bright, neutral gold. Much easier freehanding this manicure. It does take a slow, steady hand, but practice makes perfect! Thank you! 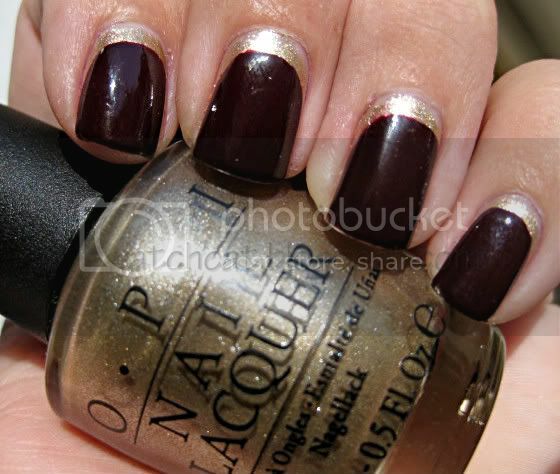 I think I'm going to be rocking this type of mani all fall and winter. Plus, it's a great way to hide tip-wear and rejuvenate a mani! This looks excellent on you. Good color choices and excellent application. I love Fall too, I love the colors I associate with Fall. Have an awesome weekend. Ooo I love this!!! Thanks for the idea! That moon manicure is seriously hot. I've always neglected my nails, but now I'm starting to get more into polish. I may have to give this a shot. Great job! Flowers + cat = Happy Anniversary!